High winds and rain can combine to devastate a roof. At Third Coast Roofing, we understand that some roof repairs simply cannot wait. Though different circumstances can trigger a need for emergency roof repair, most situations arise out of weather-related damage. High winds, hail, or excessive rainfall have finally worn your roof down, and the elements have invaded your home to spoil any sense of comfort or ease. An emergency need for repair does not only signify an inability to achieve comfort in your own home. It could also apply to imminent damage to other parts of the structure. In most instances, this has to do with rainfall. The danger that major leaks present cannot get overstated, as they can threaten the very stability of your home. The next time you need emergency roof repair in Houston, TX, do not delay: call the team at Third Coast Roofing at 832.792.4975. Basically, a home that can no longer resist the intrusion of water needs an emergency roof repair. If you fail to call for immediate service in the face of a roofing emergency, you can put your roof at risk for failure in the event of more severe weather. The following situations can commonly create the need for emergency repairs. 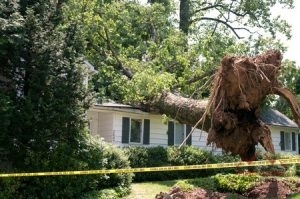 Extensive rainfall and wind can combine to topple trees onto a roof. High Winds: Arguably the most common reason for emergency repairs, high winds can wreak havoc on a roof. If the roof has gotten old or not had the benefit of regular inspections, then winds can do an excessive amount of damage. 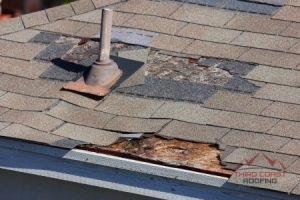 The loss of many shingles calls for emergency repairs, as your roof becomes vulnerable to rain. High winds also carry debris, which can rake across and shred a roof. Lenghty Rainfall: An extended period of rainfall, combined with high winds, creates the danger of fallen trees. As the rain soaks the ground, it can decrease a tree’s stability to the point where it simply falls over. This kind of impact will devastate a roof, as will repeated instances of smaller limbs colliding with the surface. Hail: Any hailstorm will do damage to a roof, and repeated storms will always require repair. An emergency situation arises when large hail actually penetrates the roof. The next time a massive hail storm rolls through, go into your attic afterwards. If you see daylight through the roof, call for emergency repairs. Regular maintenance and inspections can help prevent against the need for emergency repairs. No amount of preparation can account for every eventuality, however. If you ever need emergency roof repair in Houston, TX, call Third Coast Roofing at 832.792.4975. Updated on August 21, 2018 at 3:27 pm by Third Coast Roofing.